In 's-Hertogenbosch, the spring of 2017 saw the building of a - somewhat controversial - new reconstruction of the medieval well on a prominent spot in the market place. The well itself is not even very noticeable, as the stone-built wellhead is enclosed within a wooden structure with a spire-shaped roof. 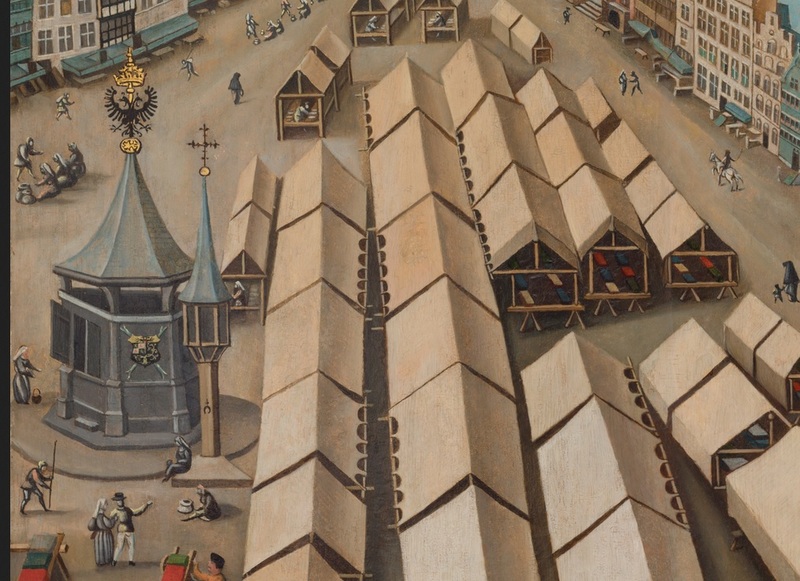 The historical reconstruction is based mainly on the well's representation in a famous painting of the Lakenmarkt (Cloth Market) of 1530. Well communities, also in the western Netherlands? To mark the reconstruction, a book was published, entitled: Terug op de Bossche Markt. De stadsput en het Onze-Lieve-Vrouwehuisje. It recounts that the great investment of building the well house with its slate-covered spire roof around 1522 was funded by the city council. In 1632 the well was replaced by a pump. The regular maintenance of the water supply system was a responsibility of the city ward committee. The authors also remark that many medieval towns in the Netherlands had a similar system of public water provision. Indeed 's-Hertogenbosch was not unique. In the historical literature, Zutphen and Roermond are well-known examples of towns with a network of public wells. In these towns the wells were maintained by a ward committee whose primary responsibility was the maintenance of the well, whereas in 's-Hertogenbosch this was a secondary task. Yet it is doubtful whether such a system of public wells was customary also in the towns of the western Netherlands. We shall focus on the case of Leiden. Leiden has a rich historical archive, but references to public water-supply facilities are few and far between. It is certain that Leiden in Early Modern times did have ward pumps (bonpompen). In the 18th century at least some ward committees' accounts include a regular section (capittel) devoted to the maintenance of fire-fighting equipment, wooden quayside revetments (platingen) and the pump. The accounts do not mention where exactly these pumps were located. Walking around the city nowadays, one may still find four (stone-built) pumps, apart from the pumps in the almshouse courtyards. Two are located up against the Hooglandse Kerk church, one against the façade of the Town Hall on the Breestraat, and one in the Garenmarkt place. The pump on the northwestern side of the Hooglandse Kerk is crowned with the sign of the Burcht ward (Fortress ward) and bears the inscription 'Bon Burgstreng'. The other, facing the Hooglandse Kerkstraat, is known to be the pump belonging to the bon Kerkvierendeel, although the mark 'KX', the sign of this ward, is not easy to spot on its obelisk-shaped finial. The earliest reference to maintenance of the pumps of the Burgstreng and Kerkvierendeel wards dates from about 1725. But it may well be that these pumps were installed some 50 years earlier. That the four surviving pumps should be the only public water-supply facilities for the over 60,000 inhabitants of Leiden in the third quarter of the 17th century would be remarkable, to put it mildly. And what about the Middle Ages; did people in those times not require water for domestic use? Fig. 2: Left and centre: pumps against the façade of the Hooglandse Kerk. On the left, the pump of the Burgstreng ward (Fortress ward). Right: the pump against the façade of the Town Hall. Historical town plans are a further source we might consult for answering this question. Four plans were selected: those by Liefrinck (1576), Bast (1600), Blaeu (1649) and Hagen (1670). None of them offer conclusive evidence of any predecessors of the four above-mentioned pumps. Elsewhere in the town we do see wells depicted, recognisable not so much by their brick-built wellhead, as by a sweep (putmik) or a windlass installed above the well. In most cases it it clear that we are dealing with a well, but not always. Assuming that the town plans are on the whole reliable representations of the town, it is interesting to see whether the number of wells changed through time. The number of depicted wells can be counted with the aid of a GIS program. To this end, the historical town plan was rotated and re-sized ('georeferenced') to match as closely as possible the cadastral map of 1832. Liefrinck's map proved somewhat distorted, but the perspective in Hagen's map is so good that it fits almost seamlessly. Fig. 4: The map by Hagen (1670) projected onto the waterway and road pattern of the cadastral map of 1832. The four selected historical maps together revealed almost 30 wells. This number includes some wells counted 'in duplicate'. For instance, well number 18 in Liefrinck's map is probably the same as that shown by Bast as number 20 or 21. 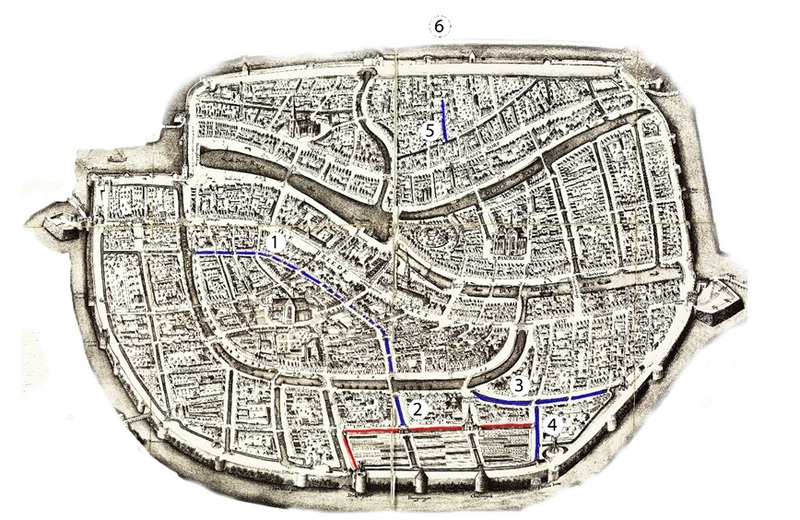 The analysis of the historical maps shows that in late medieval Leiden, other than for example in 's-Hertogenbosch, Roermond or Zutphen, no clearly identifiable wells seem to have been present in public space, in streets or squares. Apart from a possible well in Maredorp (no. 22) and maybe, but hard to distinguish, a pump near the Haven (no. 31), all of the wells seem to be in the back yards of housing blocks, probably on private premises. These wells are hard to label as ward wells. Probably they were shared among a few neighbouring households. So we may infer that at the end of the Late Middle Ages communal wells may not have been unknown in Leiden, but that a fully-fledged system of communal water-supply points maintained by ward committees seems to have been curiously absent. ... but also a new question! A second point that may be inferred is that through time the number of depicted wells is reduced. 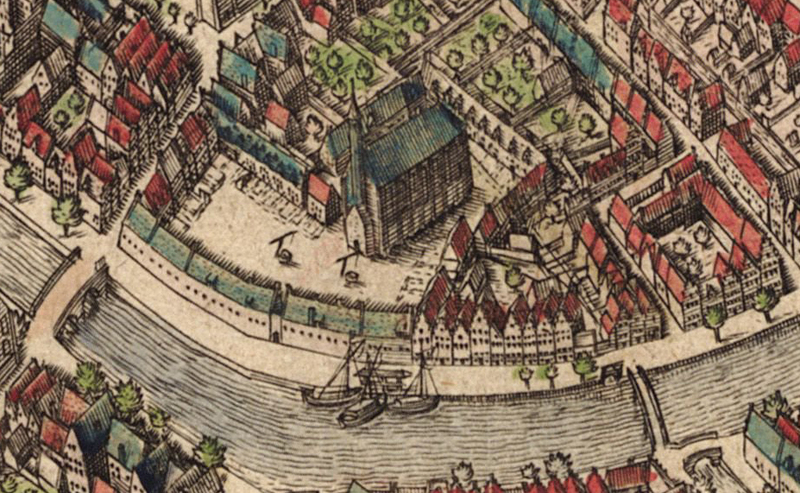 Liefrinck in 1576 shows four or five times as many wells as do Bast, Blaeu or Hagen. Now it may be the case that wells, especially in the second half of the 17th century, were replaced by pumps. Pumps were usually placed up against buildings, rather than in the middle of a street. In a town plan drawn as a bird's-eye view, pumps will therefore be difficult or impossible to spot. But even if some of the wells were replaced by façade pumps , this is unlikely to explain the full reduction. And any transition from wells to water pumps should not be expected until the second quarter of the 17th century at the earliest. Moreover, and more significantly, there is not just a reduction in the absolute number of wells, but also in their relative number. 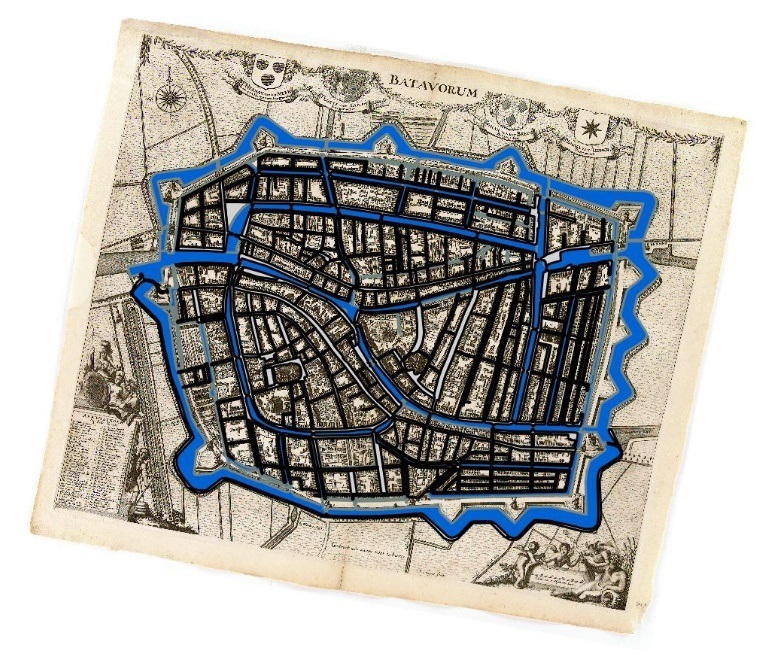 If the number of water-supply points had kept up with the rising population of Leiden - from roughly 12,000 around the time of Liefrinck's map to at least 60,000 at the time of Hagen's map - one would instead have expected a fivefold increase on the maps. Was the accessibility of water sources reduced in Early Modern days? Preliminary results from another type of source, archaeology, suggest the very opposite. The number of excavated wells dating from Early Modern times appears to rise spectacularly with respect to the Middle Ages... Are the sources really contradictory, or is something else going on? More about this in the next blog! With thanks to Ellen Gehring, Erfgoed Leiden en Omstreken (ELO), for making available the georeferenced town plans. Helpful suggestions came from Ronald van Genabeek ('s-Hertogenbosch), P.M.J. de Baar (Leiden), Pieter-Jan de Vos (ELO), Xandra Bardet (Groningen) and the study group Mapping Historical Leiden. © Roos van Oosten and Leiden Medievalists Blog, 2017. Unauthorised use and/or duplication of this material without express and written permission from this site’s author and/or owner is strictly prohibited. Excerpts and links may be used, provided that full and clear credit is given to Roos van Oosten and Leiden Medievalists Blog with appropriate and specific direction to the original content.